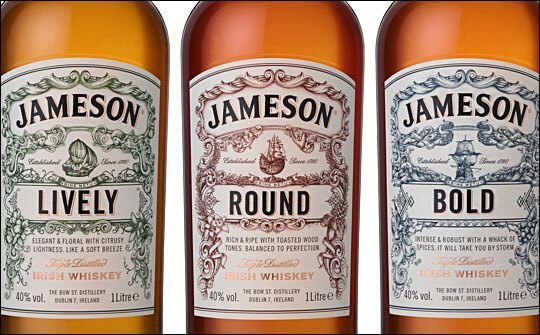 Pernod Ricard Irish Distillers has restructured its family of Jameson Irish Whiskeys. The new portfolio is made up of The Whiskey Makers Series, the range of Heritage whiskeys and The Deconstructed Series with the original Jameson Irish Whiskey at the core. The new family of whiskeys is intended to drive further interest globally in Irish Whiskey, while highlighting Jameson’s wide offering, giving drinkers an exploration path into super premium whiskey. This is a new range of super-premium Jameson whiskeys that sits within the refreshed family and is comprised of three whiskies that celebrate the people behind Jameson and their craft. Created collaboratively by Jameson head distiller, Brian Nation; head cooper, Ger Buckley; and head blender, Billy Leighton, the range gives Midleton’s craftspeople a unique opportunity to shine a light on their individual areas of expertise. The Whiskey Makers Series is set to deepen consumers’ understanding of Irish Whiskey production through the exploration of three key tools, after which the products are named: The Distiller’s Safe, The Cooper’s Croze and The Blender’s Dog. This is a new collection of super-premium Irish Whiskeys that bring to the fore over 200 years of remarkable stories and milestones from the brand’s rich history. Created to better highlight three world-renowned Irish Whiskeys – Jameson Black Barrel, Jameson Crested and Jameson Signature – each expression in the range tells a different story from Jameson’s past. Jameson Black Barrel is a triple-distilled Irish whiskey that pays tribute to the cooper’s method of charring barrels for a second time. Charring is a traditional method for invigorating barrels, although today at Midleton double-charred barrels are used by choice rather than through necessity. The expression uses a blend of ‘small batch’ grain and traditional pot still Irish Whiskey, which is distilled just once a year at Midleton, and is matured in a combination of American oak, sherry casks and double-charred bourbon barrels. Time spent maturing in these barrels imparts the whiskey with intensified notes of vanilla sweetness and caramel, alongside toasted wood, fruit, and warm spice. Jameson Black Barrel is available globally with an RRP of €47 or local equivalent (70cl bottle, 40% ABV). Jameson Crested, launched globally in March 2016, is a triple-distilled Irish Whiskey that celebrates the first drops of whiskey to be bottled, sealed and labelled at the Bow Street Distillery in Dublin, marking the moment in time (1963) when Jameson took full control of the whiskey making process, from grain to glass. Up until then, distillers – including the Jameson Distillery – sold barrels of whiskey to bonders to bottle themselves, however, reports of whiskey bonders watering down their whiskey in the 1960s led Jameson to complete the process inside the distillery walls to protect the quality of the whiskey. 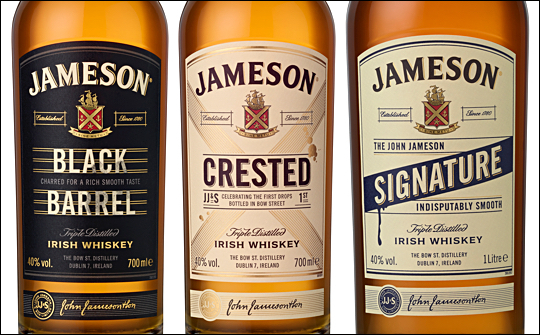 Jameson Crested brings together rich pot still Irish Whiskey and grain whiskey, matured in a high proportion of sherry casks, as well as bourbon barrels. The result is a nose of vivid sherry and pot still aromas, a palate of toasted wood, spice and chocolate, and a warm, lingering sherry finish. Jameson Crested is available globally with an RRP of €36 or local equivalent (70cl bottle, 40% ABV). Jameson Signature is a triple-distilled Irish Whiskey that bears the signature of John Jameson, a mark of quality that has appeared since the early days of the Bow Street Distillery, when all casks were signed off by John Jameson. The expression celebrates this tradition and the generations of meticulously transcribed distillers’ notebooks, a sign that attention to detail remains at the heart of Jameson. Jameson Signature is a commitment from the brand to uphold the founder’s core values of craftsmanship and quality, with a robust and complex whiskey that boasts deep flavours of cedar, vanilla, citrus and dried fruits and a smooth balance of honey. Jameson Signature is available in Global Travel Retail with an RRP of €40 or local equivalent (70cl, 40% ABV). Jameson Bold, influenced by pot still whiskey, is an intense and robust whiskey, with a strong influence of spices. Initially sweet and creamy, with an abundance of soft fruits, the pot still spices develop to bring a perfect balance of rich barley notes and mellow baked apple. Jameson Bold is available in Global Travel Retail with an RRP of €36 or local equivalent (70cl bottle, 40% ABV). Jameson Lively, influenced by grain whiskey, offers an elegant and floral taste combined with a citrus lightness. Its soft and sweet taste, provided by the perfume bon bons alongside turkish delight, combines with drying hints of citrus to balance the sweetness. A little chilli oil brings a prickle of spices to the mouth. Jameson Lively is available in Global Travel Retail with an RRP of €36 or local equivalent (70cl bottle, 40% ABV). Jameson Round, influenced by the wood contribution, is a balance of rich and plump charred wood tones. A perfect harmony of diverse flavours, sweet vanilla fuses with soft ripe fruit and, together, combines with the rich Pot Still Spices on a firm foundation of toasted oak. Jameson Round is available in Global Travel Retail with an RRP of €36 or local equivalent (70cl bottle, 40% ABV).